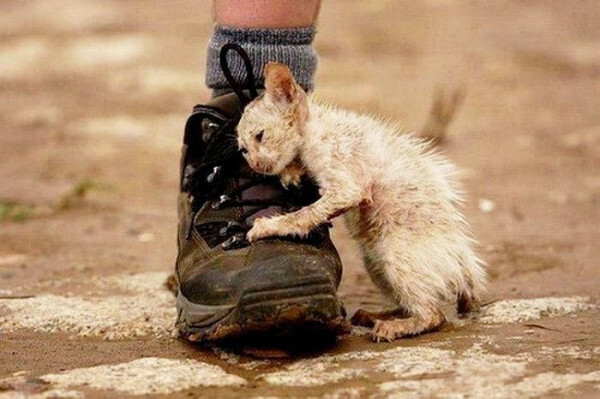 This tiny kitten is just one of the many anipals in Japan who need our help. I have been closely following my friend @pepismartdog’s reporting on the tragedy unfolding in Japan. Yes, we all remember the March 11 earthquake, tsunami, and subsequent nuclear catastrophe. We raised money at the twitter pawpawty to help the World Vets Organization treat and assist animals affected by the triple disaster. We felt sorrow, we did what we could to help… and then most of us became distracted with other tragedies (tornadoes in the South and Midwest, massive flooding…). Every week, there seemed to be something new calling for the compassion and generosity for which our anipal community is so well-known. But, back in Japan, the crisis continued, unnoticed by most of the world. Our attention spans are so short these days. Many of us did not realize that when the residents in the 20-km area surrounding the nuclear reactors were instructed to evacuate, they thought it was for one night only and were instructed to leave their beloved pets behind (with enough food for a couple of days). Livestock and horses were left in their stalls. Everyone evacuating believed the assurances that they would return in just a day or so. It has now been nearly three months since the devastating earthquake… and three months since the evacuation of the 20 km “hot zone” around Fukushima. Animals are still waiting for their trusted humans to return. Many heroes have ventured inside the zone to feed their pets, leave food and water for others, but still the animals wait… many dying an agonizing and slow death. I saw a video yesterday of a woman sneaking into the zone to feed her dog, then quickly jumping back into her car to leave. The dog ran after the car in desperation…. his face fading in the background as the car disappeared from his view. Heartbreaking to watch… heartbreaking for the woman… heart wrenching for the dog. But this is one of the lucky pets whose humans practice civil disobedience and risk fines, jail, and radiation exposure to bring food into the zone just as often as possible. Please read and share. We must keep our focus on our friends in Japan who will continue to face challenges for month and years to come. Please don’t forget. #WestieWaves to our anipals of Fukushima. This entry was posted in Random Thoughts and tagged animal advocacy, civil disobedience, Fukushima, Japan, nuclear disaster, pepismart dog, pets left behind, silent victims, WestieWaves. Bookmark the permalink.